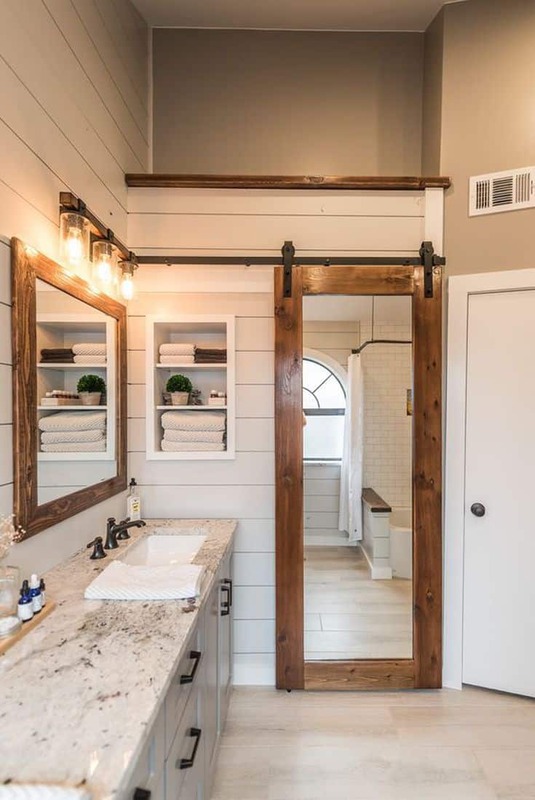 Oozing with farmhouse appeal, barn doors are great for adding separation between individual rooms including the bathroom, pantry, bedroom, and even the kitchen. 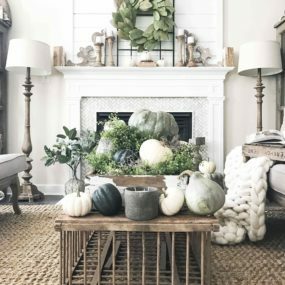 Furthermore, they’re extremely versatile they can feel rustic when they are placed with farmhouse décor or modern when they’re incorporated into a contemporary atmosphere. 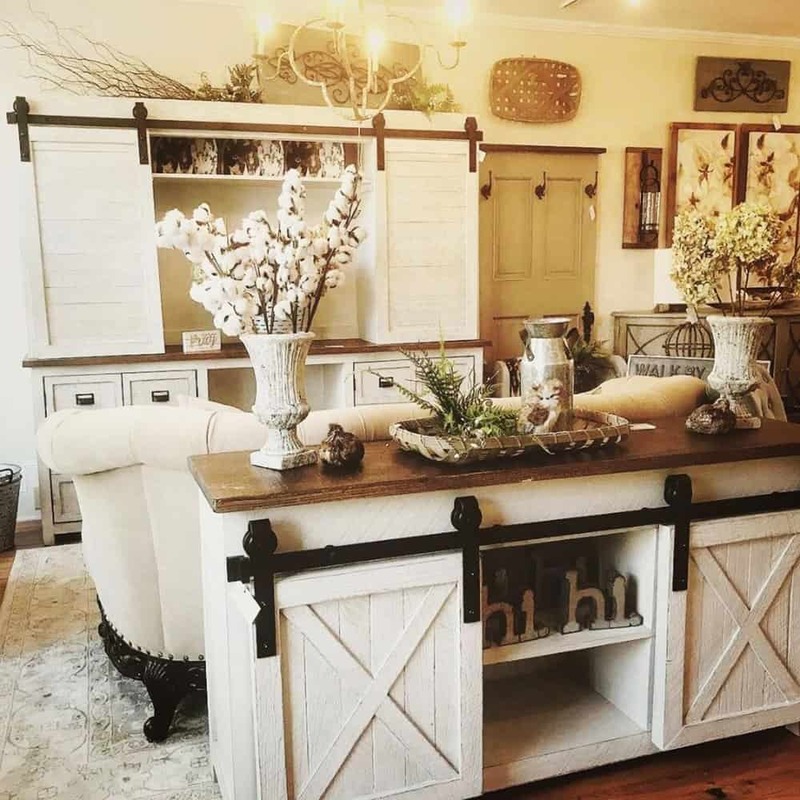 If you have been searching for some inspiration on how to seamlessly integrate barn doors into your décor, look no further we have the ultimate guide. 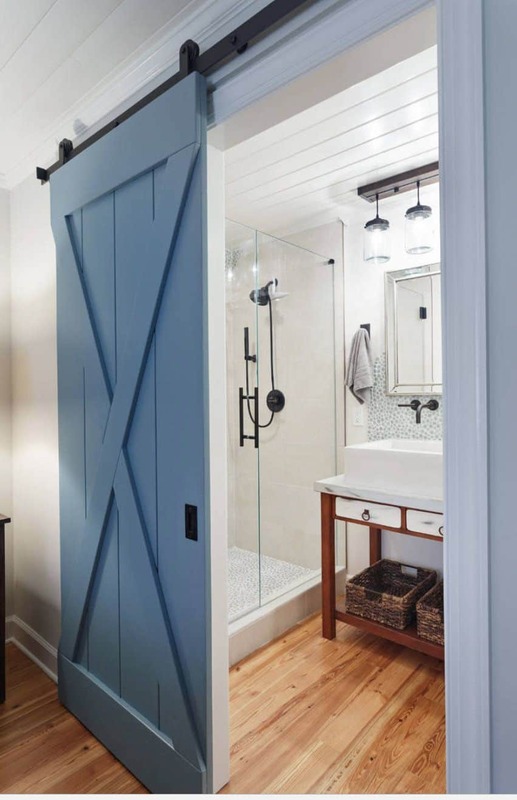 Whether its a large or small bathroom having barn doors can make a huge difference in the way the room is displayed. If you have a smaller bathroom or a half-bath, changing your door is one way to bring a brightening yet charming effect to the room. One of the biggest and most noticeable advantages of having barn doors as part of your bathroom is how little floor space they take up. Additionally, there is the sliding feature which adds a fun twist. 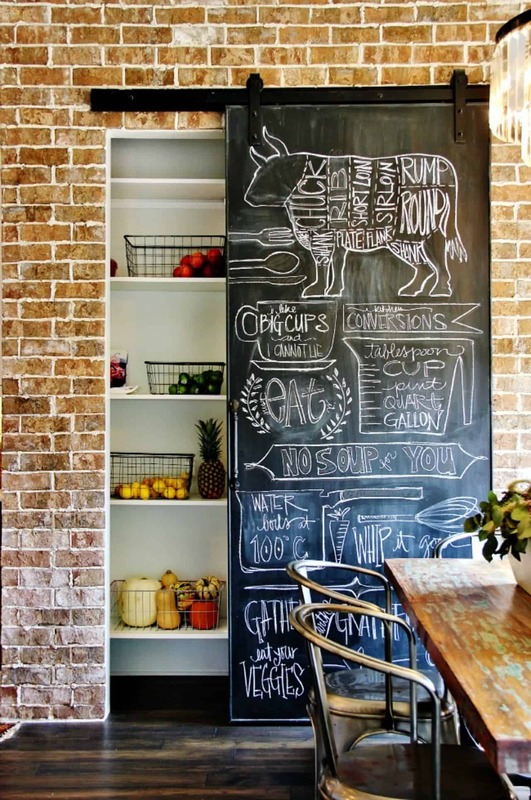 A chalkboard barn door is one of the best investments you can make in your kitchen, it allows you to write what you need, when you need it and have it displayed at any given time. 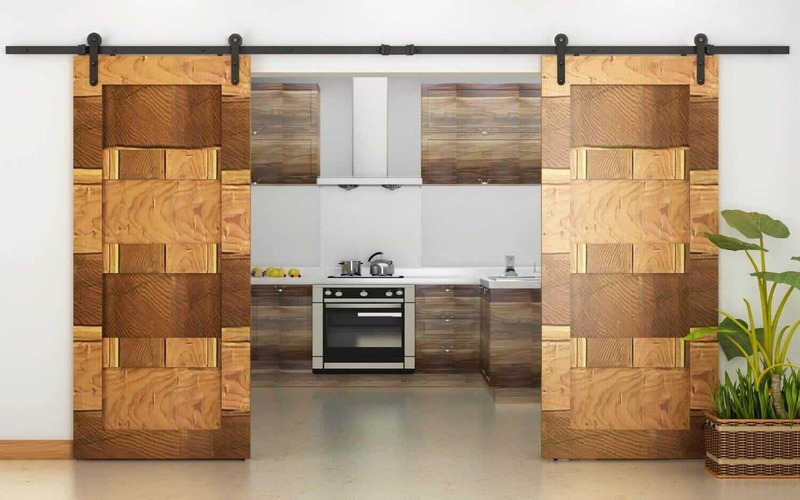 A barn door could well be what your kitchen needs for a unique yet engaging charm. If you have a pantry changing your door to a barn door could be exactly what it needs to have a hint of different. 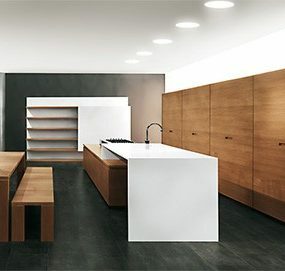 Consider having your kitchen bar doors have a chalkboard aesthetics to bring a multifunctional approach to your décor. A chalkboard door also works well in a child’s playroom. 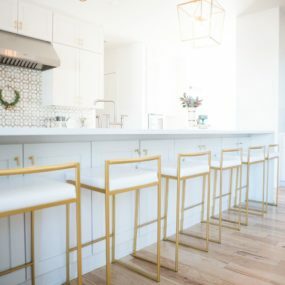 Regardless, if you are working with a large counter or a kitchen island that has some space you want to add barn doors that match your decor seamlessly. Your barn doors do not need to be large and in charge sometimes they can be small and cute instead. 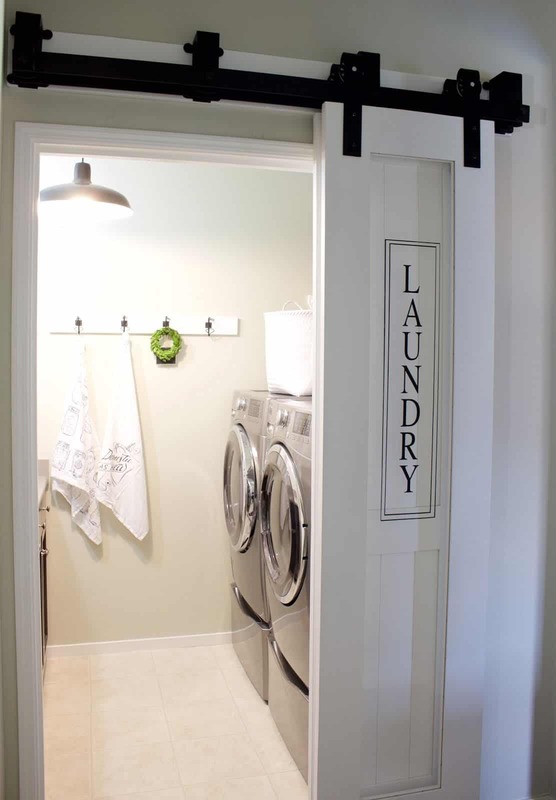 A smaller barn door works great when you want to conceal something in your kitchen, laundry room or even both areas. Think of it as a chic form of keeping prying eyes from your utilities. Metallic doors bring a contemporary approach that still has a farmhouse approach, but with a twist of something extra. 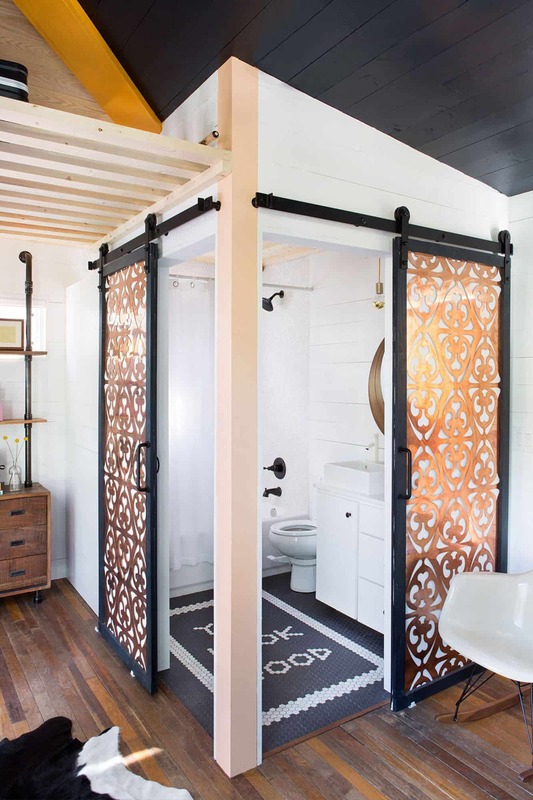 Oh, how we all love taking a classic item and transforming it into something more, something much more- that is where a metallic barn door comes into play. These beautiful pieces of artwork will not only brighten any room, but they will make you feel as if you are crying unique pieces of are right in the comfort of your space. Take your barn doors, one step further by adding labels to them. The label will add a little something unique in the door and can double as decor. 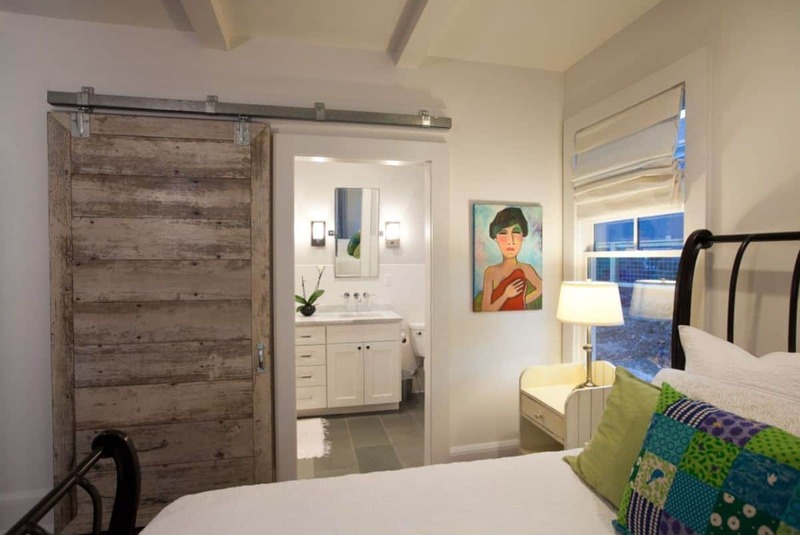 One of the best features of barn doors is that they can be used almost anywhere. If you have an open space that can double as a storage room, adding one or two sliding barn doors could be just what you need. The idea is to use your new doors as a chic almost comforting form of concealing areas of your home. Pattern is one of the best ways to bring a hint of character and personal style to your home without taking away from your decor. Most barn doors come in neutral tones with little to no pattern or additional areas. However, adding a patterned twist to your barn doors is also an excellent twist. Add a chevron pattern to update the room and give it a fun yet still simplistic twist. Texture can also be added by simply painting the doors with unique paint patterns. 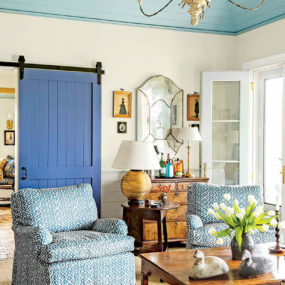 When in doubt consider blue barn doors. 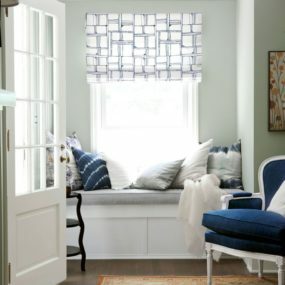 Blue is always a good idea as it blends beautifully into the room while still adding that hint of much-needed color. Whether you are a fan of bright hues or simply want to add a hint of color to a room, painting your barn doors is one way to achieve your desired color display in a room. Consider using bolder colors in rooms that need a larger appeal or lighter hues for those that want just the tiniest kiss of contemporary. 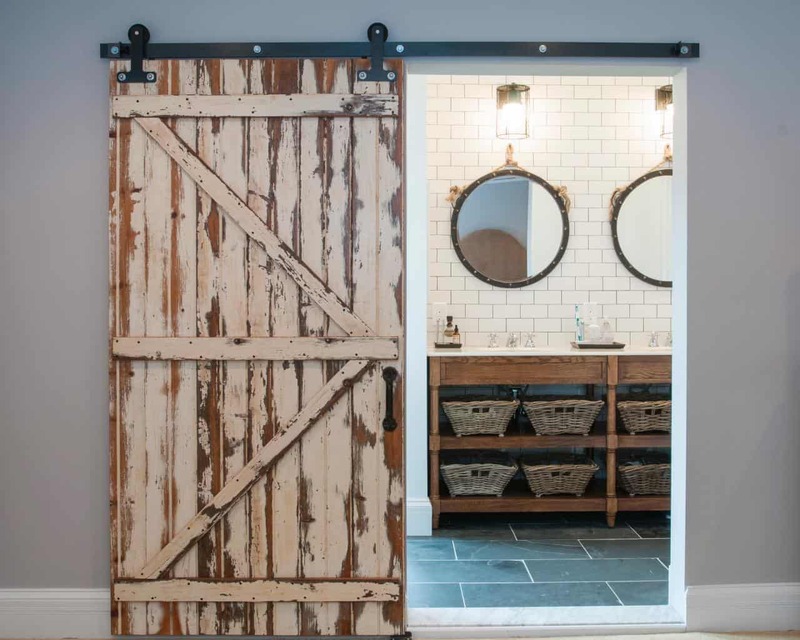 Using your barn doors as mirrors is one of the best ways to have a multipurpose use. The idea is to have one piece of furniture work for multiple different areas. Interchanging your bathroom doors for barn ones could leave you with little to no mirror options. However, that does not have to always be the case. Use one of your new and improved barn doors and transform them into a mirror. You will still have the barn door aesthetics, but with a twist that works in the room beautifully. 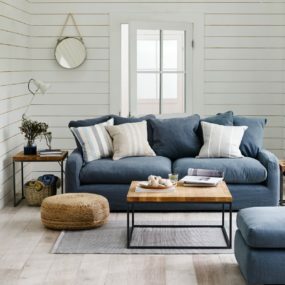 A simple separation can make a huge difference in a room, particularly if you are interested in making the room feel larger and separate in a modern type of way. 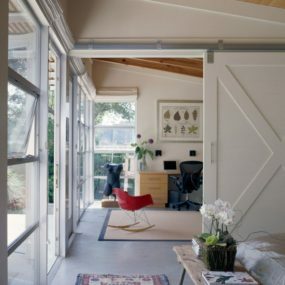 If you live in a studio or a smaller apartment you might not have all of the space you would like, that is where dividing barn doors will come in handy. They will give you a sense of privacy without taking much floor room. Consider them an easy way to add a hint of separation while still being chic and even charming. Whether you have a small tv, or a large one sliding barn door will make a huge difference in the room as it allows you to modify how you want your appliances displayed. 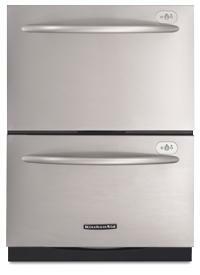 While many of us would like a large tv screen may want to not have it as exposed as other appliances in the home. In that scenario, consider having smaller barn doors hide your tv. The sliding mechanism allows you to expose or hide your tv any time you decide to do so. This is a great way to take your tv room to the next level. 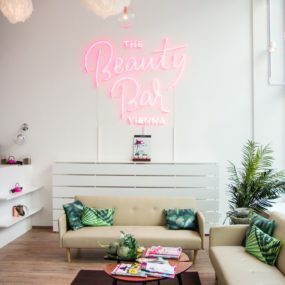 How do you feel about having bar doors? Share with us your ideas below.